Ever since I found out one of my childhood computer games has been posted to the inter web, I’ve probably played the game a few times a day. Ah, the days of Oregon Trail. Naming members of your wagon. Choosing your occupation — farmer, teacher, banker, etc. Buying your supplies. 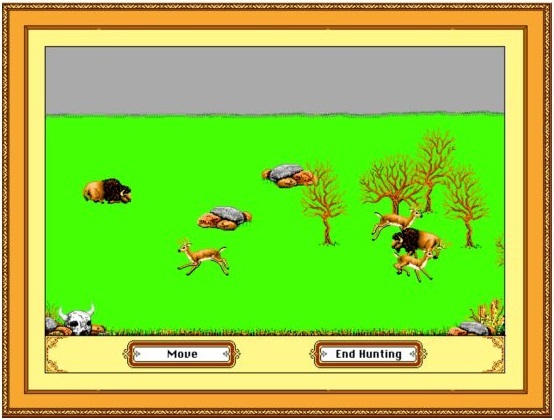 Hunting deer and other animals. Carrying only 200 pounds of food back to your wagon. Oh, a member of your wagon — Clara — is suffering from exhaustion. Another member — Simon — has dysentery. Wait, what? Lucy got sick and died in a moment’s notice? Another Oregon Trail version allowed the player to write a little something on the gravestone. Anyway, I love love love playing this game again and remembering the little things. Oregon Trail and Where in the World (or USA) is Carmen Sandiego were probably the most played educational games during my school years. As I play through the game (over and over and over) now, I have a better grasp of the objective. When traveling, I’m aware of the overall health and the distance between landmarks. I highly doubt I was aware when I was younger. 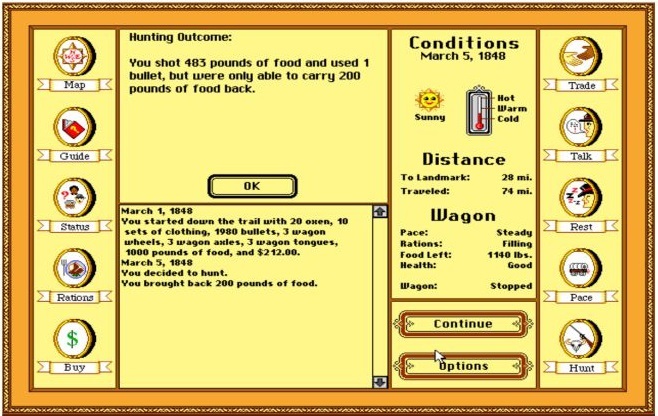 My focuses were the amount of food, where my wagon was on the map, and how to get the highest score. I don’t believe I really understood everything about the game. Now that I’m older (and so much wiser), I think I was a complete dummy as a kid. Of course, I thought I knew everything, but I didn’t. Now, I have a strategy — keep all family members alive and carry the maximum amount of supplies (oxen, clothes, bullets, etc.). The game still entertains me after all these years even if my hunting skills are below average. I’ve given up on shooting rabbits and squirrels — they run really really really fast and they only provide 1 pound of meat anyway. Three or four bullets are needed to take down a normal deer, but I can normally take down the bigger and slower animals with just one bullet. With extra food, I can trade it for clothes, oxen, and other supplies — something I don’t think my younger self did. I’m pretty sure I tried to keep all members healthy and achieve the highest score possible. The best part about this game is it’s on the web. I don’t need to download it — just pull up the web address, find the game, and begin to play. If you have some time on your hands, play the game and enjoy your youth for a moment. 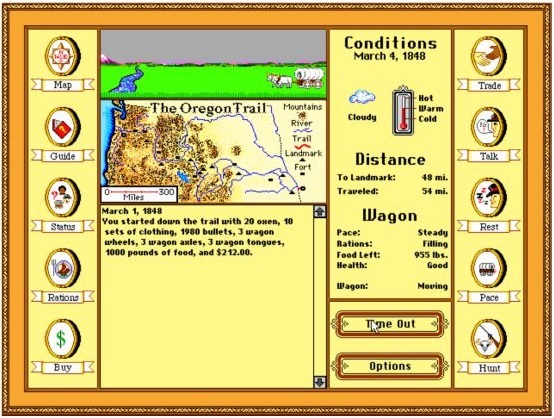 Just Google: free Oregon Trail deluxe and click on the link that leads with archive.org. Now, I have to find Carmen Sandiego. LOL … I remember Paige deliberately killing us on the trail! I didn’t understand her meanness and was so mad at her. I’ve played the game a few times. oh the memories. totally miss this game. With four sisters, I usually used their names and when one of them made me mad or whatever then I used your name. 😉 I hated the 200 pound limit when hunting. I mean come on! I shot all those deer and buffalos! I should at least be able to haul all of that to my wagon! Yup, I need to go play that game now. Oh my goodness! Oregon Trail!!! I purposefully tried to kill my sisters in the wagon. 🙂 Great! Now, I need to play that game again. Thanks, Jenny!